"While tablets get all the attention these days, there’s a reason why laptops continue to be the computing device of choice for most people. Notebooks offer real keyboards for faster typing, they’re better at multitasking, and they offer a lot more power for everything from editing video and creating PowerPoints to playing the latest games. So what type of laptop should you get?" 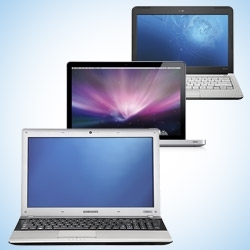 Laptops, like phones and tablets, can be a very personal choice. There is no one laptop that suits everyone's needs and you should think carefully about what you are spending your hard earned money on. Along with the 5 handy tips that Laptop Magazine offers, there is another consideration you should keep in mind. You should be very mindful of what kind of laptop screen you get. The current trend is for most laptops to have glossy screens these days, which means that while movies might look brighter, you will also see a lot more glare. Matte screens are harder to find, but I personally find them easier on the eyes for day to day activities. You should also investigate the viewing angles of your screen if you intend on sharing your laptop. You are bound to spend a lot of time watching that screen, so making sure that it is as easy on the eyes as possible can make a huge difference in your experience.